The Dividist Papers: Ann "hominem" Coulter - Some Godless notes. Ann "hominem" Coulter - Some Godless notes. UPDATED: 06/28/07 Onthe occasion of Godless paperback publication. I paid full retail at the airport (you are welcome, Ann). Started reading on the four hour flight back, and finished it in the afternoon at home between naps. I started on the plane while simultaneously listening to the new album by the Dixie Chicks. Bad idea. Almost immediately my nose started to bleed from the contextual conflict and I ripped off the headset. "Focus! Focus!" I thought to myself "One screed at a time." The Dixie Chicks will have to wait. I enjoyed my first Coulter read much more than I expected, although I would not actually describe "Godless" as a conventional book. It is a collection of essays, with a thin thematic coat of "Church of Liberalism" metaphorically painted across the surface to create the impression of a single coherent theme. The theme does not work. The essays stand on their own, but the attention grabbing title (Godless - The Church of Liberalism) does not come together as a theme, as the case supporting the title is never made. 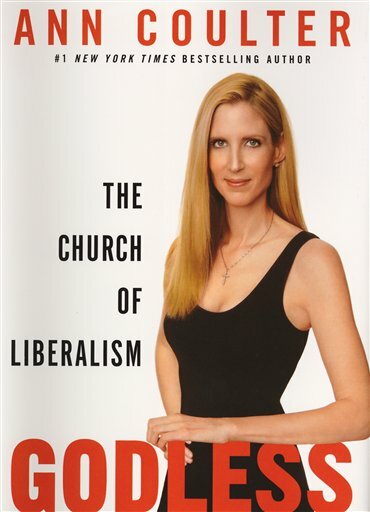 In the first chapter she makes an effort to build the foundation, and her conclusion is explicitly stated at the end of the chapter: "Liberals can believe what they want to believe, but let us not flinch from identifying liberalism as the opposition party to God." Problem being, her only support for the conclusion is a hodge-podge of interesting but disconnected anecdotal anti-liberal diatribes. She then leaps the logical canyon in a single breathtaking bound to this grand but unsupported conclusion. After that chapter, she does not even really try to get back to the theme except as catchy subtitles for the remaining chapters. Remaining chapters (essays) are on the topics of: Liberal failure to deal with Crime (Chapter 2); Willie Horton and the 1988 Presidential Campaign (Chapter 3); Abortion (Chapter 4); Liberals using victims as spokespersons to deflect debate (Chapter 5); The Failure of Public School Teachers and Education (Chapter 6); Liberals using Science as a Political Football (chapter 7); and an extensive "debunking" of the Darwinian theory of evolution (chapters 8-11). To be fair, Anne Coulter is not writing a doctoral thesis here. "Godless" is simply a well executed bit of political propaganda, and I mean that in a good way. Coulter has an agenda, she writes in the service of that agenda to entertain and sway opinion to her objective. In that regard, she is one of the top tier of propagandists working in the in political cotton field that is an election year, harvesting the hearts and minds of the American electorate. All are/were highly effective entertainer/propagandists that play primarily to their base of supporters/audience, working in different media but always in the service of their propaganda agenda. A primary tool of all propagandists, is the use of facts - documented, provable carefully groomed and selected facts - to create an impression of overwhelming evidence in support of one's point. Operative word is "selected". It is also useful to ignore inconvenient facts that contradict the agenda. As an example, If I wanted to make the case that Ann Coulter's primary propaganda weapon of choice is the logical fallacy of "Ad Hominem" attack, I would support that agenda by first coming up with a clever title for the blog post, then barrage the reader with a long list of actual quotes from her book where she employs the "Ad Hominem" attack. Chapter 5 "Sobbing Hysterical Women"
This list does not include chapters 8-11 which are a pretty good set of essays on the topic of Evolution and Intelligent Design, and include a minimum of Ad Hominem arguments. The section stimulated my curiosity, but I'll need to do a little more research on the subject before commenting further. There is food for thought here, and I hope to revisit this topic at some unspecified time in the future. The essays I found most interesting and thought provoking were the very essays that Anne Coulter did not broadly utilize the "Ad hominem" attack - Including chapters 2,4,6. and 7. Hmmmm. You don't suppose that she reserves the "ad hominem" technique to obfuscate and obscure arguments where she actually does not have adequate facts to support her case? I wonder. If so, Chapter 5, buried in the middle of the book, regarding the Jersey Girls, Cindy Sheeehan, Valerie Plame and Joe Wilson is her weakest essay, since it is the chapter where she is completely unrestrained in her vitriolic personal attacks. There have been 3 Democrats (JFK,LBJ,JEC) and 4 Republicans (RMN,RWR,GHB,GWB) elected President with 50% or more of the popular votes. There has been one Democrat (WJC) and two Republicans (RMN,GWB) elected President with 49% or less of the popular vote. There has been one Republican (GWB) and no Democrats elected President while losing the popular vote. 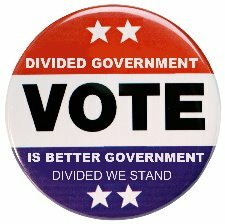 Finally, since 1960, there has never been more than 63% of the voting age population that actually cast a vote, so no President in that time has ever been elected by a majority of voting age Americans. I'll stipulate to "life" and "national defense", but "limited Government"??? Today's Republican Party??? NFW. Maybe the Republican party of Ronald Reagan can make that claim. Maybe the Republican party of Newt Gingrich can make that claim. But today's Republican Party has surrendered the right to make any claim on the Reagan legacy or Libertarian foundation of limited government advocacy. 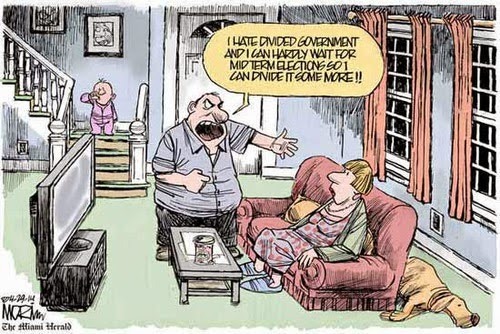 This is a new kind of Republican: Big Spending, Big Deficit, Big Government Republicans. 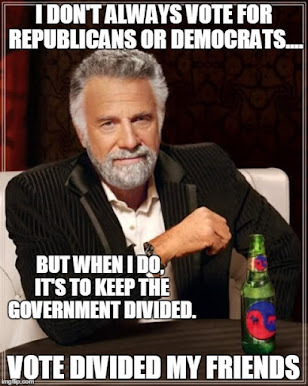 The only argument is whether "Today's Republican" single party control of the federal government over the last five plus years will unambiguously lay claim to being the Biggest Government, Biggest Federal Growth, Biggest Spending and Biggest Deficit party of all time, bar none. Lady Jane at a Lady's Ruminations has a Godless review. Larry at Blame Bush has a Godless review. Ann Coulter reviews Ann Coulter. Mrs. Betty Bowers reviews Miss Ann Coulter. Scoobie has a Godless blog. Newsmax has a Godless review. Bloggers Rude Pundit and Truthdig rudely suggest there may be some Godless plagiarism. Howard Kurtz at the Washington Post thinks the Media is paying too much attention to Ann. Jill at Feministe has a Godless feminist perspective on Ann Coulter. Larry Johnson at No Quarter is amused to be called the "leftist Ann Coulter". Canadian Ian Maclean thinks Ann Coulter make some good Godless points about 9/11 widows. Daniel Morgan at Get busy livin' or bloggin ' has some thoughts about Coulter, Dembski, and the Death of Godlessness. Technorati tags: divided government, Intelligent Design, Creationism, Evolution, Godless,Global Warming, Ann Coulter. Thank you for the link and the e-mail. I can't say I agree with your post on Godless. :) Ann is one of my favorites. How can Ann be someones favorite? What about her is even remotely likeable? Is calling teachers parasites a good admirable thing? Is being totally uninformed and misguided about modern science good or admirable? I like a good read but 3 chapters on evolution that make no salient points speaks to her not doing much but talking to hear herself talk. anyone actually interested in checking out the scientific basis of evolution, ID and creationism is best referred to the Talk.origins FAQ site. Here is a good analysis of her Evololution chapters.